It’s been a quiet baseball off-season this past Winter. A few players went here, some went there. Then it went quiet. Nothing much happened. Then Manny Machado signed for a lowly $300million to go to the San Diego Padres. The once damp squib of a Hot Stove was now absolutely napalmic. Not wishing to be undone, and desperate to smash the $325million contract record set by Miami Marlins (and now New York Yankees) slugger Giancarlo Stanton, the current darling of Major League Baseball, Bryce Harper, signed a new contract with the Philadelphia Phillies for a paltry $330million (cash in the pocket guaranteed). Pocket change. A dull off-season. Nothing much happened, right? Even as we sit here, hammering away at the keys for this review, it’s just been announced that one of the greatest players ever to step to the plate, LA Angels beef mountain Mike Trout, is on the verge of signing a new contract with the Angels for a pauper's salary of $430 million. That’s approaching half a BILLION pounds, if you're in the UK. For one player. That’s around $60,000 per at-bat, $25,000 per inning, $3,000,000 per month, $4,000 per hour or if you want to really quibble, $70 per minute. Soccer has absolutely nothing on baseball when it comes to contracts and salaries. Whilst all of this financial melee was playing out over the winter, the news about a new R.B.I. Baseball game for 2019 went largely overshadowed. An announcement trailer carefully tiptoed it’s way to YouTube and waited patiently for ‘fans’ of the series to get wind of it. Baseball has nothing on football when it comes to a consistent stream of quality games. And games to shout about, at that. We’ll admit, after the debacles of the previous two entries in this series, we approached the new 2019 revision with a due sense of caution (and a little sprinkling of dread). Have the developers paid any attention to the criticism lavished upon these games? Will it be worth your time and hard-earned pennies this year, or will you be left wanting yet again? 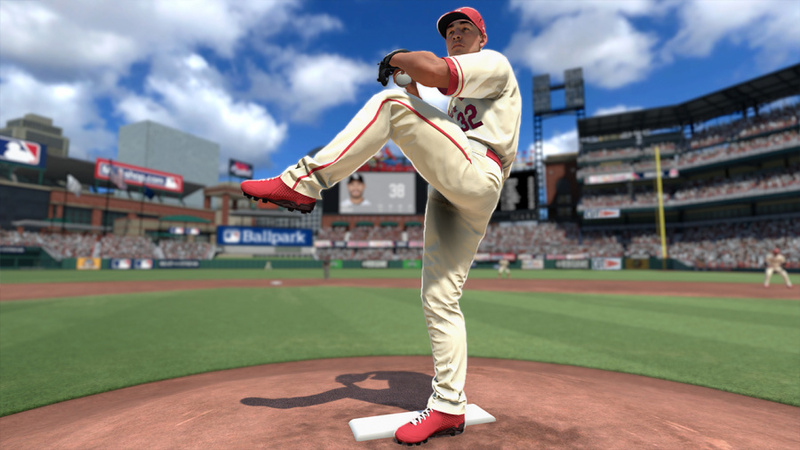 With mere days left until 2019 Opening Day, let’s take a look at the current edition of RBI Baseball and see if it’s as loaded as Mike Trout’s new contract, or a soggy poo sponge like the Orioles win record last season. We’ll get into the meat and potatoes of this game first. How does it play compared to previous editions? Hold on to your underpants because, wait for it... it's actually good. Everything feels like it’s had a little nip and a little tuck to make the game feel and play better. The players feel a bit weightier, like they have something behind their swing. That each swing differs from player to player. Even down to when a hit connects. Granted, there is little variation in how you can manipulate your swing and where you ultimately want to guide the ball, but that’s not really what RBI is about. It’s not the sterile, clinical true baseball experience that you expect and 100% deserve with, for example, MLB The Show. But this isn’t MLB The Show, this is R.B.I. Baseball, a more arcade-style experience. Pitching hasn’t changed. It’s still the same old command of pulling down, left, right and up on the direction pad to send your pitch hurtling towards the batter at differing speeds. Again though, think arcade over sterile accuracy. 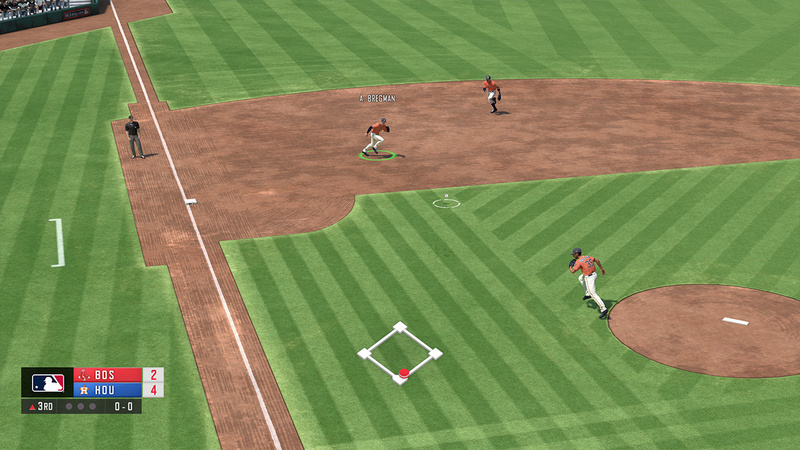 One of my major problems with the previous games was with the fielding. This appears to have been tightened up a good bit. Players now appear reasonably where they should. 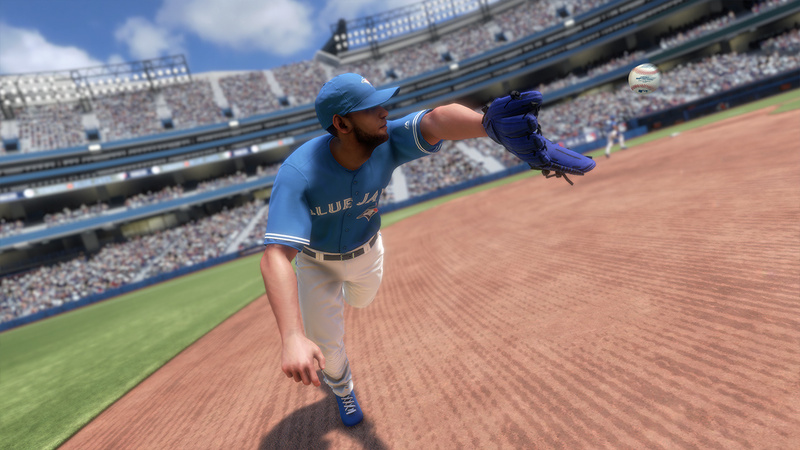 With a bit of practice, you’ll be fielding with the best of them, or you can go for assisted mode and have the CPU do your fielding for you. We feel it takes away a lot from the experience if you choose to go this route, though we understand why it’s an option. Inexperienced players will likely otherwise end up hurling their Switch out of the window, so it’s good to appease all audiences. Hitting has improved greatly. One of the major problems w had, and one that became glaringly obvious in Home Run Derby mode, was the relative ease with which you could slug a monster hit up and out of the ballpark. 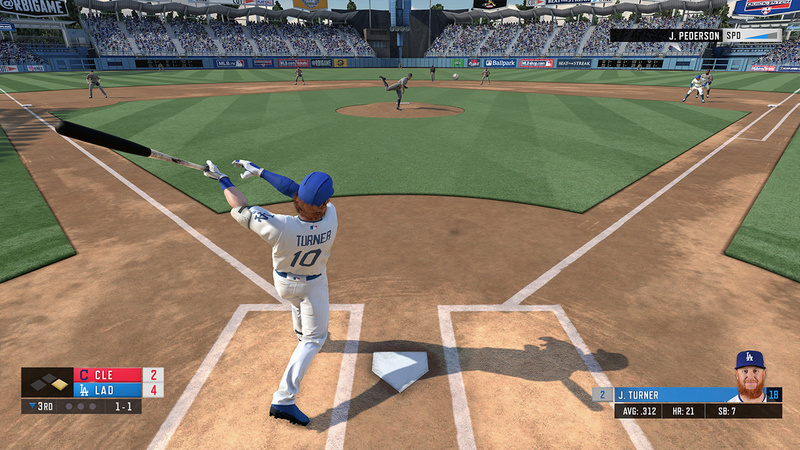 Hitting tweaks become apparent in Home Run Derby mode yet again this year. We noticed that it’s far tougher to hoof a bunch of Moonshots and slay your opponent by 80 jillion home runs to nil. You’ve got to work at it now and really grind it out for the sweet-hitting spot. This spills over to the game as a whole and, in our opinion, makes hitting a lot more fun, and the final scores a lot more realistic. Still though, R.B.I. isn’t entirely perfect here. It still feels – and we can’t quite put our finger on why – a bit lacking. Compare it alongside something like Ken Griffey Jr or 2020 Super Baseball for example, and it just doesn’t quite give you the same arcade enjoyment factor, yet it’s supposed to be an arcade-like experience with a few extra trimmings. It’s certainly an improvement on last year, though. Visually, R.B.I. has improved greatly. Players are more detailed and look a lot more like who they are supposed to be. Again, we’re not talking The Show levels of detail here, but models are certainly a vast improvement and each player has individual animation quirks to shake things up a bit. It would appear the developers have listened to criticism and reacted positively, too. Stadiums now feature a lot more detail and the crowds are actually animated this time. No more shoals of fish swimming around the stands like in the previous game. It’s not all one big, glorious Technicolor dreamboat though. In our experience giving the game a thorough seeing to for this review, we found that sometimes the visuals would chug – especially in portable mode. It’s more obvious during menu transitions and during the Home Run Derby mode. Slap a 500ft dinger and so much is going on that the screen judders and struggles as the meteor you just walloped from ground level catches fire and begins to leave Earth’s atmosphere. You’d really think that there are other Switch games out there that would put a greater strain on the console than this. This was a problem in last year's game, so there really is no excuse for it to be present here yet again. A new, bouncy soundtrack accompanies the game this year. We're not really one for gushing over what’s been licensed for a game soundtrack. If anything original music would be nice rather than the reliance of, say, Percy Faith, Bette Midler or Dicky Rock loaning a few tracks to a game in order to make a few quid. A few more vocal snippets grace the ‘commentary-lite’ that’s sprinkled across the game. Nothing on the scale of FIFA et al, but just enough variation that it doesn’t get on your nerves over the standard “out”, “strike”, “you’re out” and so on. But what of the game itself? Well, there’s more reasonably good news here. It’s minor changes equating to vast improvements in certain areas, but anger and frustration in others. The main staples are all there. 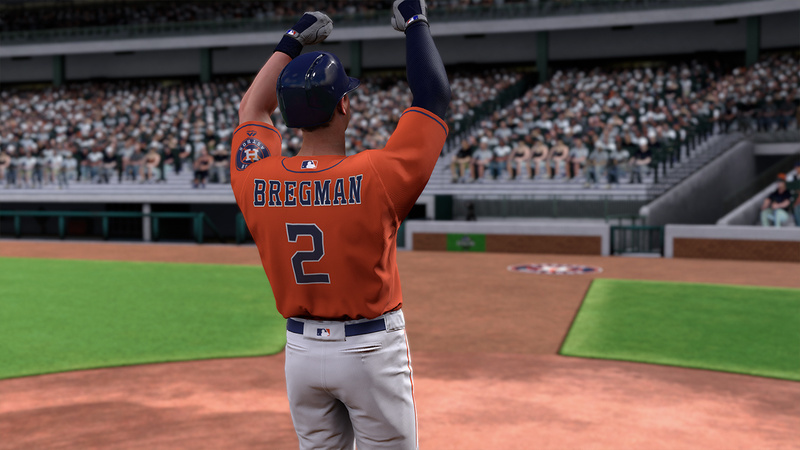 Exhibition games, Franchise Mode and Home Run Derby all feature. However, a big change to Home Derby Mode is the ability to customise your player bracket and play it your way, including with any of the 165+ MLB Legends players that the game features. This wasn’t possible before, and is a very cool addition. A glaring omission though is that online multiplayer has been removed from the Switch version yet again. Given a lot of Switch owners pay a subscription to Nintendo Online, it’s absolutely criminal that online play has not been taken advantage of here. Not acceptable. Local multiplayer is, of course, present, but that might not remove the bad taste for everyone. So is R.B.I. 2019 really worth your hard-earned? Well, compared to the previous Switch games, this year’s edition stands head and shoulders above them. Though to be honest, it didn’t really require much to eclipse those. R.B.I. 2019 still falls short of being an essential buy. There's a “that’ll do” attitude everywhere you look. It’s a shame because it’s not far from being ‘there’. Yet in 2019, we find ourselves starved again of a quality baseball game minus ‘that obvious PS4 choice’. While there are improvements across the board, R.B.I. 2019 still falls short of being a must-have baseball outing. It's fun without being deep, and the lack of online play will be unforgivable to many players. It also struggles technically, which is a shame given that it's hardly the most visually stunning Switch title. Still, if you like the sport then go ahead, buy it and enjoy a game of baseball. Slap a few whoppers. Dominate a Home Run Derby. Have some fun. Just don’t expect that fun to last; you’ll get fed up quickly and become envious of those dastardly PS4 owners. I think Baseball from Bomberman Battles PS2 Japan was still better than mediocre Baseball like above. The improvements over last year have been overstated. Of course, your review of 18 was pretty unfair and overly critical. It was a fun, solid, budget, arcadey, retro-style baseball game and I had a great time with it. Animations in this game are a bit better. Other than that, it's pretty much the same game. 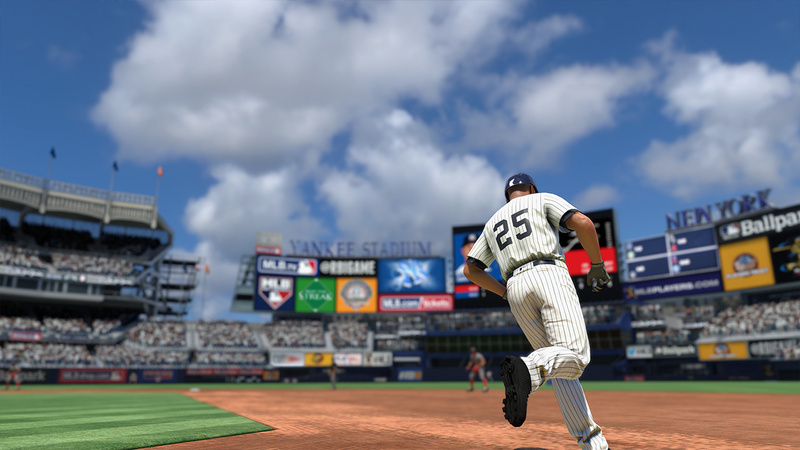 As a fan of these new RBI games, though, I'm very ok with that. Oh, also, weird that you didn't mention how buggy it is. Personally, I think it's funny/endearing, but it could be enough to drive people crazy. I've seen balls hit invisible walls and fall straight down in the middle of the infield. I've seen fielders hold on to balls while I circle the bases. I've even caught a ball in shallow left field and thrown it in to the third baseman only to have the homerun animation play. It's not like I'm CONSTANTLY having these issues, but it does happen way more often than it should, and certainly often enough that I'd think you'd mention it in the review. @Anti-Matter Well, I've never played baseball from Bomberman Battles PS2 Japan, but my opinion is that, while the "mediocre" reviews of RBI are fair, they're more due to the performance of the game/the presentation than the game itself. It's a fun game of baseball. I'll hold off on RBI until next year if nothing else releases. This year I'm gonna pick up Jikkyou Powerful Pro Baseball instead. Can we please get Madden on Switch? I don't care if it runs like Madden Overdrive, I JUST WANT AMERICAN FOOTBALL ON SWITCH! @Der Probably not exactly what you're looking for, but Mutant Football League is pretty fun. Might scratch that itch! @Krambo42 It's hard to scratch the "Switch itch" when you play all the Madden titles on PS4. One thing that I find hilarious about this series is how consistently bored the players on the cover look. It's almost like the publishers are subtly warning us about what's in the box. @Mountain_Man Ha, I've noticed that too. Even Lindor, who is like the happiest, most expressive guy in baseball. @DockEllisD The Power Pro games on the Wii were INCREDIBLE. I still dust them off from time to time. Story mode, franchise mode, life sim mode, and airtight addictive gameplay. I'm not sure if SONY would nix a port with an MLB license, but that would be a definitive Switch title for me if it was ever released. Last year's review was unfair, this year I think the score is off, but otherwise it's a decent review. I don't have the time to get into the show, but am an avif baseball fan who has bought several dozen baseball games over the years. Baseball Stars NES and the High Heat series on PC (NOT console) remain my favorites, but honestly, this year's RBI comes in high on the list. It plays well, is super fun, visually good, and well, I'm honestly loving it. It's everything I wanted Baseball Advance (GBA) to be. I strongly recommend it, except one issue - I get stutters and frame rate drops each game in the later innings. There are bugs that are frustrating, like the time a foul ball to the dugout was ruled a hit, which made me lose a game, but mostly I just can't wait to play another game... Except for those stutters... I'm hoping for a patch for those. If you like baseball, and are not playing the show, I highly recommend RBI! You'll find this year's version is a really fun baseball game to play at home and on the go. @Der I recently purchased football heroes on the eshop I think it's still on sale. But I'm definitely having fun with it. It has a season mode, online, and a decent amount of customization options. It's plays like a combination of tecmo bowl and blitz. The biggest issue I think some will have is that the games are short. It's only 2 quarters that last 2 minutes and 15 seconds each. I personally don't mind the quick pacing. It made for some epic fast pace games with many close moments. @Muddy_4_Ever Absolutely. I’m happy with the NPB rosters because I follow the league, but an MLB iteration for the west would be very welcome. Plus having a localised version would make my wife’s life much easier. Thankfully she’s a good sport. @Der Forget Madden and buy Football Heroes Turbo! And make your own team of NFL stars! @thaantman it’s not on the UK store. So annoying. No excuse why digital games aren’t on all stores. It is called MLB THE SHOW. Comes out on the 26th (baseball and F1 are back - I'm a happy man) everything else is not worth the time. Wish they bring Jikkyou Powerful Pro Baseball to Switch. @Der Yeah man... any madden would be amazing. Honestly - would have made more sense to bring Madden to the US on Switch first - instead of FIFA. I guess I'll wait and see if they patch out the bugs and performance issues. My son loves baseball and I'd like a decent version of an MLB game to play. Too bad Nintendo doesn't make non-Mario sports games anymore. Rbi baseball was one of the best baseball games on Sega so I picked it up in 17. I'll never make that mistake again. They'll need to dramatically overhaul the game if they want people to buy in. And it's the ONLY true modern baseball game on switch. They'd make so much money if they put out a good product as there are no other companies to compete with. What the Switch needs is Mario Super Sluggers. Does anyone have a list of the legends included this year? @cyrus_zuo Yeah, the High Heat games on PC are outstanding. My favorite baseball video game out of the ones I own is "High Heat Baseball 2001" on PC. Among console games, my favorite is "MVP Baseball 2005" on GameCube. Among non MLB licensed games, it's "Mario Superstar Baseball" on GameCube. Among motion-controlled games, it's "Nicktoons MLB" on Wii. Anyway, this sounds like a pretty good option considering the utter lack of competition on the Switch. I'll pick it up if there's not a better option by the time I eventually get a Switch. Besides, this may be my only oppurtunity to play as Paul Goldschmidt as a member of my Cardinals. They can't bother with Online, I can't bother to part with my $. It's not missing on any other platform. 3rd time, 3 strikes. Shame because I loved RBI as a kid. Still surprised that they haven't released Super Mega Baseball 2 on Switch. Seems an obvious fit. I'll be grabbing Baseball Stars 2 instead of this one. And in japan the power pros series is cming to switch (well i saw picture in the japanese news section on my switch last month. ) so lets hope they will translate that. @BulbasaurusRex good list of games that I know well! MVP is legendary, but I felt the games were too long, though I loved how throwing worked on defense to provide risk and reward. I love Baseball Stars, but I gotta say this year's RBI is better than Baseball Stars 2 (which I own on Wii along with Power Pros). 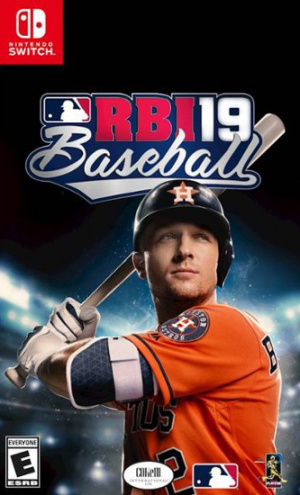 Honestly, I think if you're looking for a fun to play baseball game, this year's RBI hits the spot well. The gameplay is solid and a lot of fun. I got this game a few days ago, I picked up 2017 when it launched for Switch but I was really dissapointed. I was gonna buy last years game but they delayed the Switch version for three months without telling us why so I decided to skip it. I have to say though just going from 2017 to 2019 is like night and day. I'm really happy with the presentation of the game and I enjoy the franchise mode and the ability to trade players. Honestly for a huge baseball fan like me there is enough, although there are still obvious issues that need to be addressed, I can still appreciate the effort the new developers are putting into this. 7/10 from me.